Introduction: The brain is the most complicated organ in a vertebrate's organism. In a human, it contains about two hundred billions of neurons and non-neuronal cells. To understand the mechanisms of the brain functions is the great challenge for the researchers. Much is already done on this way; however, it remains a lot to do still, and to get deeper knowledge, new approaches should be developed. One of this is to use benefits that nanotechnology brings in this area. Nanotechnology opens up unique opportunities, not only for material science research, but also for biology, medicine, and many other disciplines. There are several kinds of nanoparticles that can be applied in brain studies, Quantum Dots (QD) being so far most often used. QD are semiconductor light emitting nanocrystals with nanometer-sized structures of unique optical properties. They have bright fluorescence, are resistant to bleaching and able of emitting fluorescent light of different wavelengths. These properties make QD perfect tools for visualization of brain structures and mechanisms underlying its functions. Due to unique QD properties, even single molecules under study can be observed. Moreover QDs can be used for brain-targeted drug delivery. Conclusion: In this review, the application of quantum dots for the brain research is considered and benefits that it can bring are discussed. 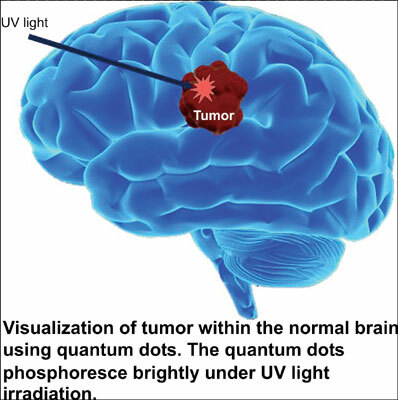 Brain, conjugates, drugs, fluorescence, quantum dots, visualization.